I’ve recently reviewed a Ukrainian Dodo strap for Panerai watches on Paneraisource, but I also picked up a couple of their general straps for use on all sorts of other watches that don’t necessary follow the Panerai style. These straps are more cost effective and use much simpler assembly techniques and follow the trend of several other recent strapmakers selling on Etsy and generally compete on customer service and providing value for money. Lets look at these straps in more detail. 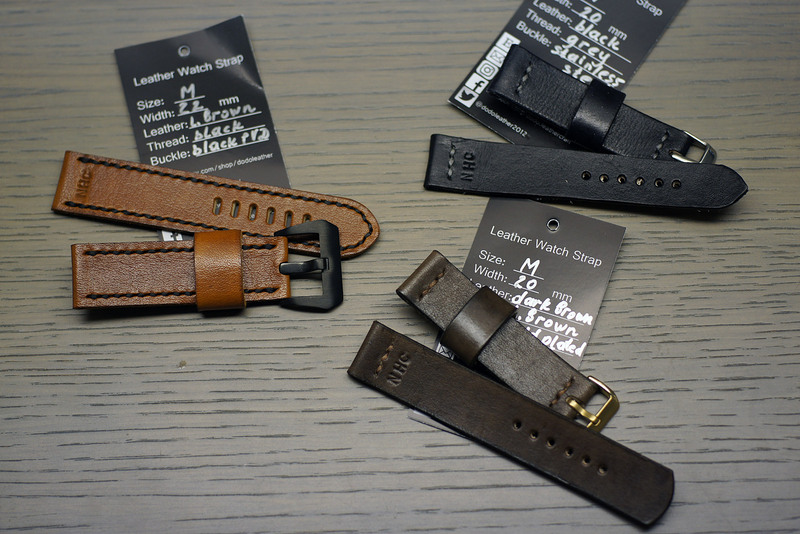 The two that I have here are a brown non-tapered strap with a gold buckle, and a black strap with a silver buckle. I also included a photo of the premium Panerai style strap in the top left that has already been reviewed. 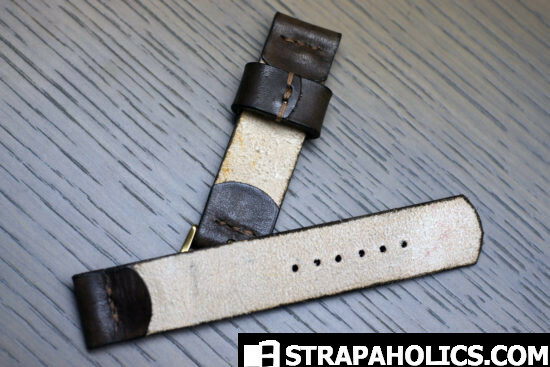 There is quite a bit of price difference between the premium and basic straps, but also the construction and quality are significantly different justifying the price of the premium straps over the basic ones. 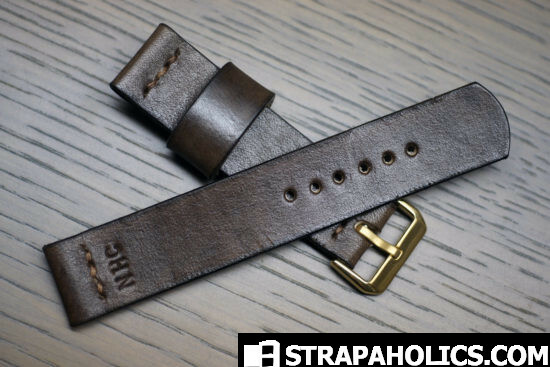 Lets first look at the 20mm brown strap. This is a basic strap, and sells for $35 from Dodo’s Etsy shop. It features basic edge-only foldover construction and minimal stitching. One floating keeper is provided. Dodo also does personalized initial stamping for no cost. 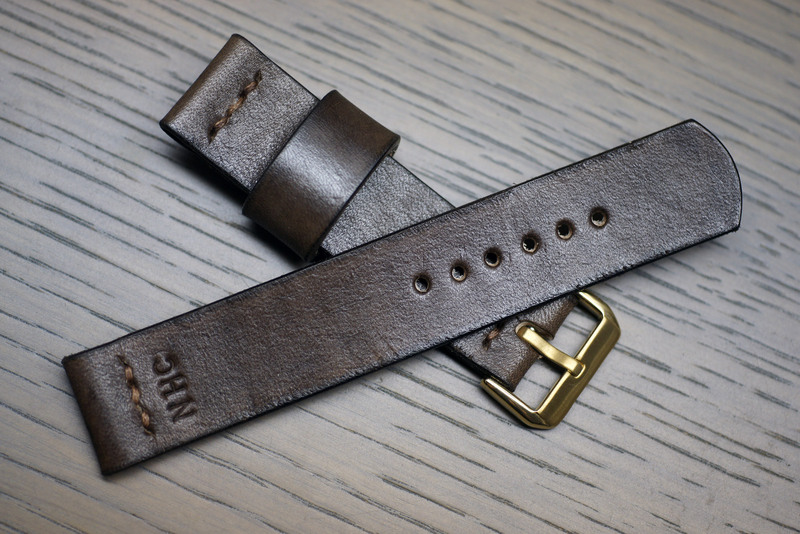 You can see my initials NHC stamped onto the straps. The strap is well made, though the amount of features and stitching is very minimal. The leather is 2mm thick, and very pliable. It is only 1 layer thick as you can see from the back. It looks like a Vegetable tanned leather that is painted by Dodo afterwards to suit. The exposed natural vegetable tanned leather on the back may or may not bother some buyers, but again, at this price point we can’t expect too much. It is difficult to paint the fleshy side of the leather since it does not take leather dye or paint too well. Next up is the black strap.. which basically has the same construction features as the basic brown strap so there isn’t much I can add to it. 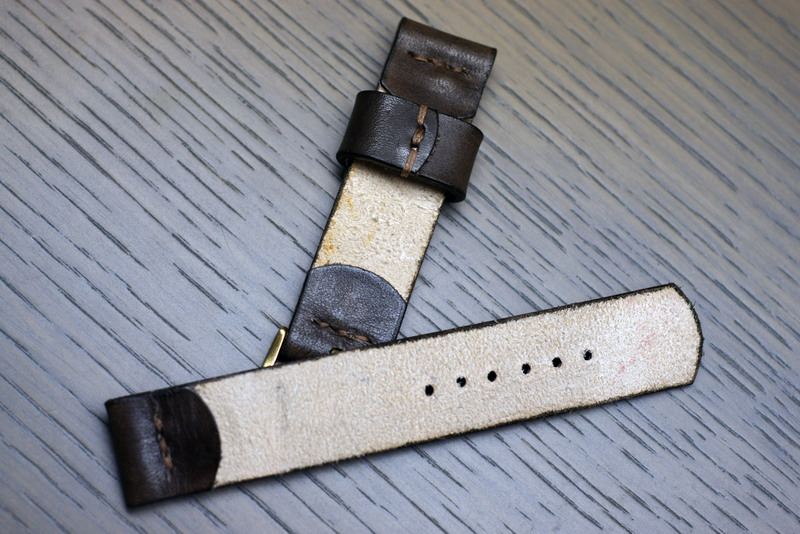 This strap also measures 20mm at the lugs but tapers down to 18mm at the buckle so may be more suitable for watches that have a 20mm-18mm original strap if you want to replace the buckle with your OEM one. 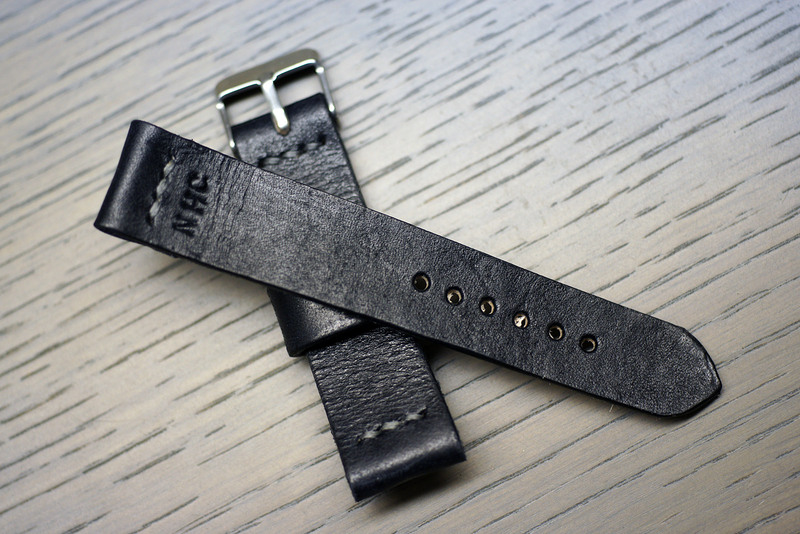 The back of the black strap is the same, with the exposed vegetable tanned leather. I believe both straps use the exact same leather as they look, feel and measure the same as each other. The vegetable tanned leather feels and smells like its of good quality and the company takes great pride in their work so I would be inclined to believe that they use quality raw materials. The owner Andrey is very responsive and very enthusiastic and willing to help with orders. 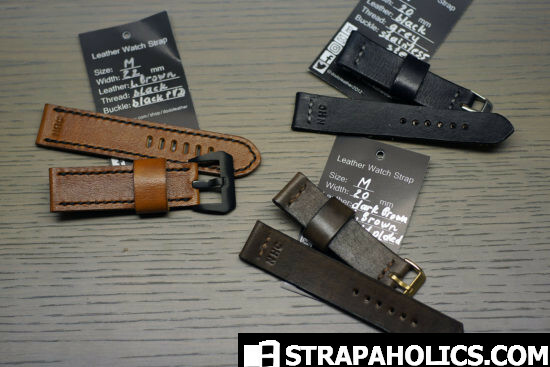 Overall they’re a good bet for a value strap and their premium straps start at $75, which is very affordable. They are also doing a crowdfunding campaign that will offer a significant discount over their shop prices for these straps. Hope you enjoyed the review! This entry was posted in Watch Strap Reviews. Bookmark the permalink. Post a comment or leave a trackback: Trackback URL.